In order to compete, it is becoming more important for brands to have a presence on social networking sites. When it comes to social media, a lot of focus has been placed on Facebook, Twitter, LinkedIn, YouTube and more recently, Google+. However, brands, particularly those that are targeting consumers age 18 to 34, should keep an eye on Tumblr. According to a recent Nielsen study, titled “State of the Media: The Social Media Report Q3 2011,” Tumblr nearly tripled its audience in the last year. In fact, it has become the 8th largest site in the U.S. Social Networks and Blogs category. The Nielsen study that I mentioned above describes Tumblr by saying that it combines elements of blogging and Twitter and allows users to post and customize everything from pictures and videos to links and quotes. A recent blog post on socialmediaexaminer.com, titled “Should You Be on Tumblr? Seven Business Case Examples,” has a pretty good explanation of Tumblr. You might want to check it out. My last two posts put forth ideas that were supported by Gary Vaynerchuk’s work. Therefore, I feel it’s necessary to mention that he is a big Tumblr fan. In fact, his main site, garyvaynerchuk.com, is powered by Tumblr. Many celebrities have also taken a liking to Tumblr, including Katy Perry, John Mayer, Josh Groban, John Legend, Britney Spears, Lady Gaga, and Joseph Gordon-Levitt, to name a few. However, celebrities are not the only ones who are using Tumblr. Your customers are as well… and lots of them. As I mentioned earlier, according Nielsen, Tumblr is the 8th largest site in the U.S. Social Networks and Blogs category. This makes Tumblr a site to watch and be on if you want to reach your customers where they hang out. This is particularly true if you are selling products or services to consumers age 18 to 34. In fact, according the Nielsen study that I mentioned earlier, 44.4% of Tumblr’s U.S. audience is age 18 to 34 and an additional 12.9% are age 2 to 17. What might be even more important is the fact that Tumblr is gaining users, not losing them. The blog post on socialmediaexaminer.com that I mentioned earlier points out that Oscar De La Renta, Ann Taylor, Rolling Stone Magazine, the Los Angeles Times, Huggies, Milkmade Ice Cream, Somebody’s Mother’s, IBM, The Museum of Useful Things, Doctors Without Borders and Newsweek are all on Tumblr. A post of socialfresh.com, titled “60 Brands Using Tumblr,” also has a list that you can use to see what other brands are doing with Tumblr. In the process of posting photos, mostly of buildings in Atlanta, and later Central Wisconsin and Minnesota, I noticed that photos of certain buildings and restaurants were frequently getting reblogged. 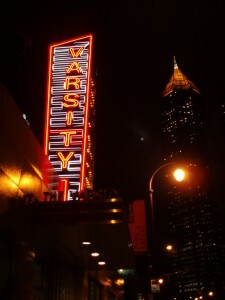 Nothing viral, mind you, but enough to get me thinking that beloved local bars and restaurants, like The Varsity in Atlanta, Georgia, should definitely have a presence on Tumblr. The same holds true for popular brands. People are already sharing photos of products and brand logos on Tumblr. Why not give them additional photos to help get your message out? If your brand does choose to use Tumblr, remember to keep in mind the audience who uses the site. The fact that Tumblr tends to attract a younger audience may be a result of this age group’s willingness to try out new sites. However, it might also be an indication that they are looking for a social networking site that their parents are not on. In other words, Tumblr users may be looking for an alternative to Facebook. With this in mind, in addition to having visually appealing posts, I’d also suggest trying to keep your content cool, youthful and fun with the hopes that it will get shared by the Gen Y audience. That alone should make brands take note, and at least consider establishing a presence on the site. Tumblr makes it easy to share content, and many of your customers are already doing so. So, why not make it easier for them to let others know about your product or service by giving them great content that they can easily share on Tumblr? Photo credit: A Year of Yesterdays on Tumblr. It was only a matter of time before young people started moving away from Facebook to another social networking site. When they heard I was using FB, my sons (ages 20 and 21) rolled their eyes and instantly decided it was time for their FB sites to stagnate and die. Isn’t it possible that young adults will get irritated with businesses/brands that seem to follow them wherever they go on the Web? You bring up two interesting points. The first point is about young people leaving Facebook. That points to the fact that Facebook still has a lot of young users. With that said, I think the current issue is how often younger users choose to share on Facebook and what they choose to share. Although some experts suggest that Gen Y is more open with their parents than other generations, I think that there is always going to be a need for a place where young adults can share information with their friends that their parents don’t have access to or knowledge of. As your example points out, young adults might not be as likely to share the same information if they think that it is being monitored by their parents and they may, in fact, delete their account. However, other young adults might still visit Facebook on a regular basis, but choose not to share everything that they do on other social networks, like Tumblr. In other words, young adults might have a social network to connect with family, one for friends, one for coworkers, one for everyone, etc. If I find any additional stats or data to support my opinion, I will let you know. On your other point about young adults getting irritated by brands that seem to go everywhere they go, the real issue is in the way that the brand maintains its presence on social networking sites, not whether they have one. Most experts agree that brands/businesses should have a presence online where their customers are. And, many experts feel that customers have begun to expect that brands/businesses have a presence on social networking sites, similar to the way that most people expect brands/businesses to have a phone number, email and website. Instead, many of the experts that I have heard speak suggest providing great content and making the brand available to consumers when they want it or need it. Consumers would only see the brand’s content if they searched for it (or something related to it) or followed the brand on Tumblr. And, again, if the audience finds the content useful, it will help the brand, not hurt it.